Finally back after too long in other forums. In our morning deck count, we hit 35 spp., including my first golden-winged warbler. (Yeah I am that much of a newbie.) Is migration already starting? Shorebird migration started by the third week of July. Early migrant warblers like Golden-winged, Canada, Prothonotary, Kentucky, etc. should definitely be moving by now. Congrats on the Golden-winged. Sadly that's become a tough bird in our area anymore. Thanks for the update. Part of my problem was my near deafness to high frequencies, so I never heard warblers till this spring after I finally got hearing aids. A godsend. It's a whole new world for me now. I spotted that guy about 120 feet away as a flash of yellow that just didn't look like a goldfinch. He then kindly came over to work our elm and birch trees next to the deck where we got great views. Gone by the time I got my camera though. FYI the Eastern population of Willets may already be gone. Any Willet you see down near the coast after mid-August is almost guaranteed to be from the Western population. There have been proposals to split these into two species and I personally think that has merit. They have different plumage characteristics, body shape differences, vocalization differences, completely different breeding habitat, and they're genetically isolated. They seem to be as good a candidate as many and better than some. I have never seen anything like this bird. 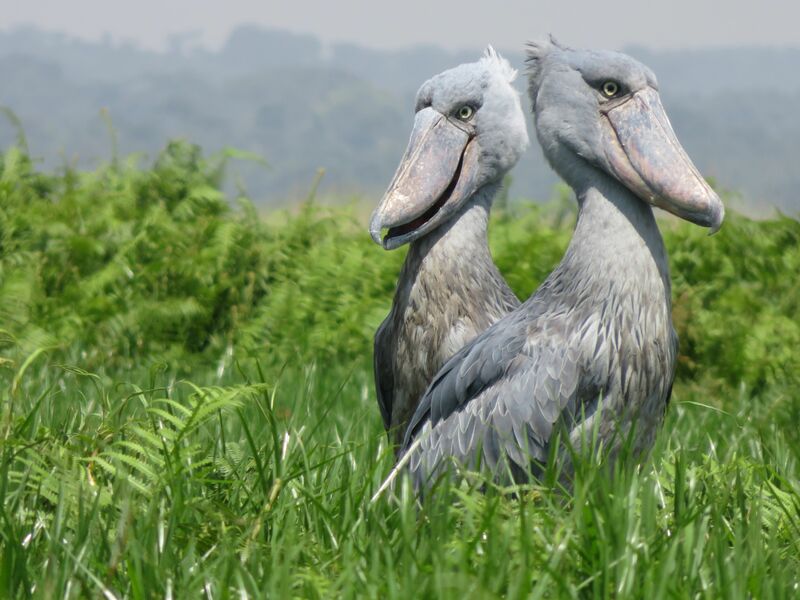 A shoebill stork! What is their main habitat ? Seriously though they occur in wetlands in parts of Africa. Great bird—but amazing pic! For ten seconds I thought it was a stone statue of a mythical two-headed bird, in the same vein as the Germanic two-headed eagle. New Presidential Seal as re designed by Ivanka ? Well, her fashion business allegedly went pear-shaped so perhaps she's been at a bit of a loose end. At least this doesn't look like work the Devil has found for her idle hands, but then again, what do I know? I've stocked my "feeder" with dead squirrels multiple times. A bird drone programmed with threat avoidance behavioral characteristics of different types of birds is starting to be used to move birds from airports to reduce the threat of bird strikes for planes. (That seems kind of birdist since in these interactions are usually lethal to the bird.) Knowing how different birds will react is key to moving the flock away from the flight path without causing them to panic and scatter in multiple directions. The CalTech study, led by aerospace professor Soon-Jo Chung and published this August in IEEE Transactions on Robotics, required one crucial first step: figuring out how flocks work, from how they communicate to how they fly in perfect formation to (most importantly) how they respond to threats. Different species of birds communicate threats at different distances, Chung added. Flocks of egrets changed their path when a drone was about 20 meters away from the nearest bird, but loons didn’t react until the drone got much closer, about 10 meters away. Second, this tightly-controlled communication system only goes so far. If a threat flies too fast or too close to the birds, they’ll panic and scatter, making them unpredictable and uncontrollable. All of this information, Chung said, was vital in building the drone’s algorithm. “If you can know how this flock will react,” Chung told The Daily Beast, “how fast, how they’re going to change their direction—if you can know that, you can use that information in your herder”—what the team calls the drone. And that’s exactly what CalTech did. Once the team understood the birds’ flocking dynamics and threat response behavior, they replicated it in a mathematical model. So far, it’s working. As part of the August study, Chung and his team traveled to Daejeon, South Korea, to see if an algorithm-guided drone could divert flocks of local egrets and loons away from a designated safe zone. In both cases, Chung said, the drone succeeded. A new and interesting bird fossil from the Cretaceous Period was found in China and fills in the picture of bird evolution a bit more. One note about the following is that the author is mistaken about the current science which describes about 10,000 species of birds existing today, not 18,000, but then we're learning more all the time so who knows. The discovery of a 127-million-year-old fossil in northeastern China is filling an important evolutionary gap between modern birds and the winged, dinosaur-like creatures that came before them. To say that birds evolved from dinosaurs isn’t entirely accurate. Technically speaking, birds are dinosaurs. They just happen to represent the only lineage of dinosaurs that escaped extinction 65 million years ago. Today, there are an astounding 18,000 bird species on Earth, demonstrating the dramatic extent to which dinosaurs still inhabit the planet. Despite their ubiquity, the origin and early evolution of birds is still not well understood. Thankfully, a slew of new fossil discoveries over the past few decades, mostly from China, have offered important new insights into this critical stage of dinosaur evolution. The latest development in this area, the details of which were published today in Proceedings of the National Academy of Sciences, is the discovery of a 127-million-year-old bird fossil found near the village of Shixia in China’s Hebei Province. As lead author Min Wang and his colleagues from the Chinese Academy of Sciences point out, this newly identified genus and species, named Jinguofortis perplexus, existed during a pivotal stage in the evolution of flight. It didn’t feature a long bony tail like other flying dinosaurs (the famous archaeopteryx being a good example), instead exhibiting a stubby tail characteristic of modern birds. Unlike the flying birds we see today, however, J. perplexus hadn’t yet evolved a fan of flight feathers on its stubby tail. Flying birds with short tails that end in a compound bone are broadly classified as pygostylian birds. Scientists are eager to understand the evolutionary stages leading up to the emergence of these short-tailed avians, which is why the discovery of J. perplexus is such a big deal. In fact, this new species now represents the second-earliest known branch of pygostylian birds.